Easy on, easy off. This poncho is an absolute essential for outdoor concerts and sporting events when the weather gets inclement. Think Mother Nature might have a second opinion about your outdoor event? 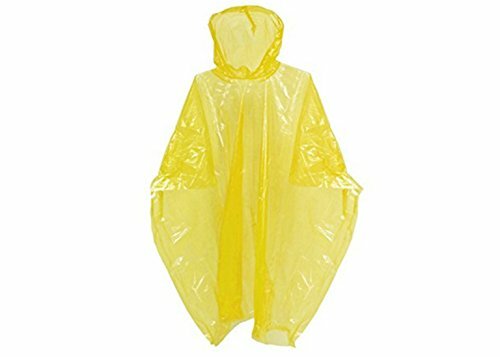 Don't let rain spoil your guests' time by handing out these yellow ponchos! These plastic ponchos are a handy handout to have around if the forecast is looking iffy. Rain Ponchos Disposable Emergency Economy- Intended for One Time Use. If you have any questions about this product by PlayO, contact us by completing and submitting the form below. If you are looking for a specif part number, please include it with your message.